CELEBRATIONS to mark the official opening of The Salvation Army in Burkina Faso took place on 25 and 26 August 2018, overseen by International Secretary for Africa, Commissioner Benjamin Mnyampi and Zonal Secretary for Women’s Ministries, Commissioner Grace Mnyampi. The joyful festivities in the capital city, Ouagadougou, were attended by Majors Dieudonné and Philippine Tsilulu, The Salvation Army’s regional leaders in Mali, responsible for the new ministry. More than 365 Salvationists and friends participated throughout the weekend. On Saturday morning, separate rallies for men and women were held. Commissioner Grace Mnyampi reminded the women that they have a divine mission of serving others, to help them know the truth of the Bible and accept Jesus Christ as their personal Saviour. In the afternoon, a youth concert took place and the presence of the Lord was felt through lively singing and dancing. Sunday began with a march of witness on the streets of Ouagadougou, during which the Africa zonal leaders took the salute. Hundreds then gathered at Ouagadougou Corps to celebrate the official commencement of Salvation Army ministry in Burkina Faso. A representative of the Mayor of Arrondissement VII was present, together with traditional community leaders who expressed their joy of seeing The Salvation Army at work in their community. The Founder’s song ‘O Boundless Salvation!’ was sung, and prayers of dedication for the new ministry were offered. Encouragingly, 28 new Burkinabé recruits were enrolled as soldiers during the meeting. 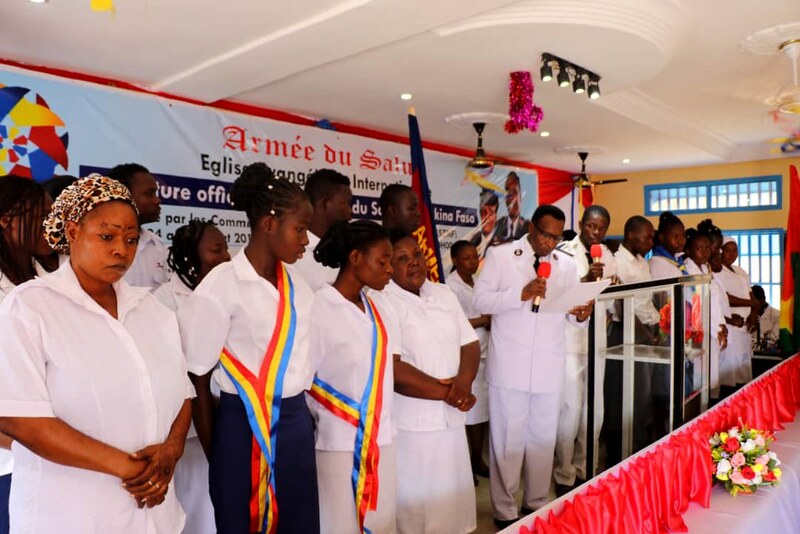 Commissioner Benjamin Mnyampi urged the continent’s newest Salvationists to ‘put on the full armour of God’ (Ephesians 6:11), in order to spiritually ‘stand firm’. Reinforcing this message was a letter from General Brian Peddle, international leader of The Salvation Army, which was read out in full. The General exhorted the Salvationists of Burkina Faso to ‘work hard – because there is a lot to do: people need to hear the good news of Jesus Christ; lives and communities must be transformed, and real needs must be met.’ The General’s message implored listeners to ‘lay their foundation firmly on Jesus Christ and to be rooted in him’. A new Salvation Army flag was presented to Captains André and Nana Togo, officers from neighbouring Mali who have been appointed officers-in-charge in Burkina Faso. Music was provided by Ouagadougou’s own corps band; the vibrant singing and dancing was bolstered by 68 excited Salvationists visiting from Mali. In his Bible message based on Matthew 28:18-20, Commissioner Benjamin Mnyampi reminded listeners that Jesus has all the power and authority, and therefore they should ‘go and make disciples of all nations’. Thirty-seven people responded to God’s call on their lives, moving forward to pray at the mercy seat. The meeting concluded with tremendous joy and thanksgiving to God for his faithfulness towards the people of Burkina Faso. Weekend activities came to an end with Commissioners Benjamin and Grace Mnyampi leading two God-honouring sessions of officers councils.